Sometimes a community partner provides fun, exercise, inspiration, confidence, and a chance to cheer for grown-ups. That’s the story of Girls on the Run Twin Cities, a nonprofit organization that teaches girls how to fulfill their potential, serve their communities, and run a 5K race. Girls on the Run is just one of many community partners that City Connects works with to provide a wide range of services, from food and clothes to summer camp and enrichment programs. 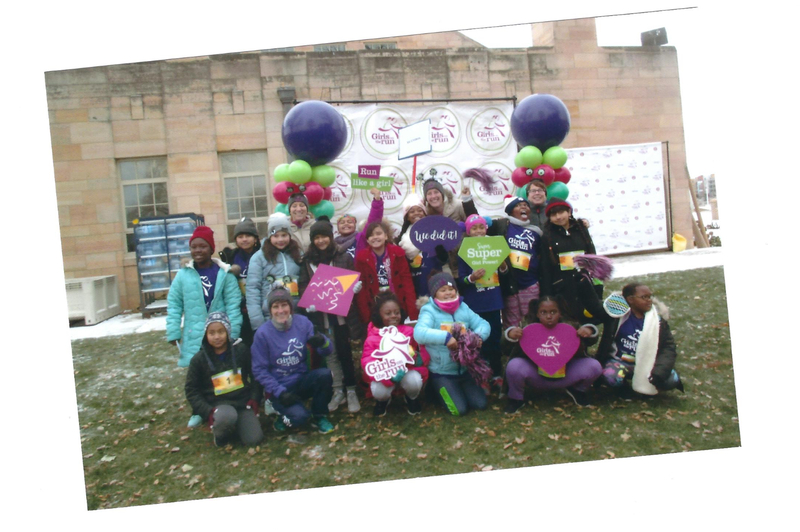 Girls on the Run — which is currently a community partner with two, Minneapolis-based, City Connects Catholic Schools, Risen Christ and Ascension — provides enrichment and the opportunity for girls to work with adult volunteers and coaches. Girls learn to meet and exceed their own expectations – a key way to remove some of the non-academic barriers that can limit academic performance. “The people at Girls on the Run are so encouraging it’s contagious,” Laurie Acker, the City Connects program manager in Minneapolis, explains. Girls on the Run provides a 10-week program that uses a research-based curriculum for girls in grades 3 to 8. High school-age girls can volunteer as coaches. Girls who participate learn what could be called the six C’s: confidence, character, care (for themselves and others), connections, competence, and contribution. At Risen Christ, coaches talked about a range of topics, including friendship, peer pressure, healthy eating, and emotional awareness. The girls also train to run a 5K race. Each girl has an adult running buddy who might be a staff person, parent, or volunteer. And there is a volunteer who provides running shoes for any girl who needs them. About 77 percent of students are low-income in the Minneapolis-St. Paul parochial schools served by City Connects. During the 5K race, school staff cheer for the girls. Some have run alongside the girls – despite being in work clothes. And at a recent race, the medals were made of Oreos and string – and everyone received one. As for the girls, they become stronger inside and out, and each one can tell her own story of achievement. In the case of one girl, this story is about how her parents wanted to run with her, but they weren’t prepared to run five kilometers. So, the girl ran with a City Connects coordinator. Her parents walked – and as they crossed the finished line, their daughter cheered them on. City Connects might link a student with a program like Girls on the Run for any number of reasons: she loves running, needs an outlet for extra energy, a chance for more physical activity, or she would benefit from more positive peer or adult relationships. The next step: Acker says Girls on the Run will expand into two more schools next year – and there are plans to create a program for boys. At City Connects, promoting physical fitness, better relationships with adults, and personal achievement is an impressive community victory, one that we are proud to help make happen.